Me and my not so hasty pudding! Hi again! This week I will be making Hasty Pudding with maple syrup. “But for supper Grandma made Hasty Pudding. She stood by the stove, sifting the yellow corn meal from her fingers into a kettle of boiling , salted water. She stirred the water all the time with a big wooden spoon, and sifted in the meal until the kettle was full of a thick , yellow, bubbling mass. Then she set it on the back of the stove where it would cook slowly….. I simply did what grandma Ingalls did, boiled 8 cups of salt water in a big saucepan. 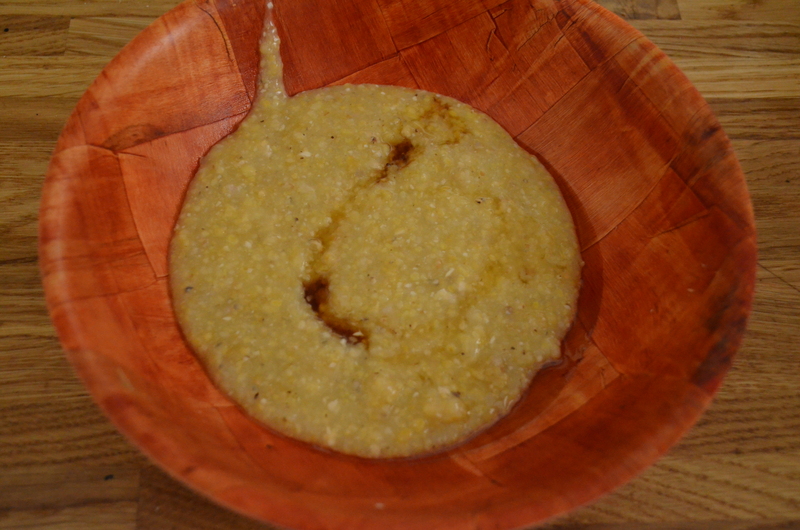 Then, at the same time as stirring, I sifted the corn meal through my fingers until it was all added. We left it to cook (on a low heat) for an hour stirring every 10 minutes to prevent burning. Serve in bowls with maple syrup. MMMMMMMM! Posted on July 9, 2013 by Claire	• This entry was posted in 1800's Recipes, Hasty Pudding & Mpale Syrup, L10's Posts. Bookmark the permalink. I have always thought the name hasty pudding to be very funny. Thank you. Mummy thought it was funny too, because it is called hasty pudding yet took an hour to cook!! That looks delicious! 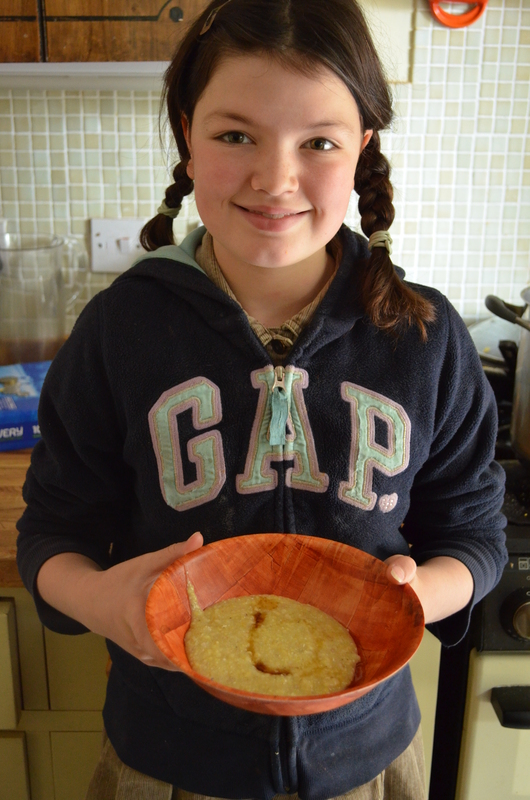 Pea and I love cornmeal pudding, and our motto is if you can add maple syrup you should! We will definitely be trying out this recipe. Thanks for sharing! (Does the book mention why the pudding is called “hasty” ? Thank you. I’ll check for you and get back to you. It looks delicious. Does it taste anything like maple syrup or porridge (cooked oatmeal)? We will try the recipe. Hi Reese! It had the texture of porridge but not the taste. It was very good though. Let me know if you try it. Bye! We often have this for breakfast – not with maple syrup though!! What do you have it with? The taste was unusual for us, and I think the maple syrup made it taste tastier!